Takeaway: Customized competency mapping ensures all employees know how to do their work safely. Competency mapping is the process of identifying specific skills required to operate effectively in a given trade or profession. Competency mapping may be more important to occupational health and safety than most people realize. Keeping workers safe involves safety protocols and protective equipment, of course. But it's also important to make sure employees have the right skills and training for the jobs they are tasked with. Depending on the software used, most competency maps link an employee's responsibilities to the potential hazards of a particular job. From there, the data links to the training required to mitigate these hazards. There is no one-size-fits-all solution when it comes to competency mapping. Depending on the industry or type of business, it can take weeks or months to set up. And then the mapping has to become an ongoing part of the company's safety program, with continuous updates. The benefits, however, are well worth it as this mapping streamlines safety training and ensures that it is timely, relevant, and effective. The final format will ultimately depend on the type of industry, what information is readily available to safety managers and supervisors, and how many jobs and hazards must be taken into account. Mapping the competencies required for, say, construction jobs done at height or those performed by underground miners will need to factor in more hazards and be on a larger scale (learn about the Top 6 Construction Hazards and Considerations). This will require more extensive mapping and a more widespread application of the system. This complexity means that mapping competencies for newly hired temp workers who have to do their jobs alongside the regular employees will sometimes involve different departments, operations, and locations (see Transient Workers vs. Temporary Workers: Know Your Training Obligations for a related discussion). As mentioned above, the listing for each business will need to be unique and customized. Just lifting another company's competency map will not be anything more than a waste of time. Because of the need to integrate federal, state, and local health and safety laws, the programs will need to be orchestrated by professionals and industry experts. With HAZWOPER, we can see the way competency mapping works for industries that involve HAZMAT operations. The mapping for these industries would identify employees – temporary or permanent; typical or emergency responder – and connect them with the training and skill sets they'll need to safely and successfully engage in these tasks (learn about Delivering Effective HAZWOPER Training). Ideally, the potential hazards identified in the data must not only be grouped by general or primary hazards, but also according to their secondary, related, and specific hazards. You might not need to separate your training sessions so they address each individual subgroup – that would be a lot of class time! – but you need to make sure that your training sessions address the specific hazards your employees will be encountering. Each item on the list should have its own unique identifying code, and the map must identify the tasks associated with each hazard. 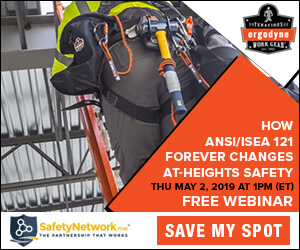 If, say, the skill required to mitigate fall hazards while working on high-voltage overhead power lines is identified as "Fall from Height to Lower Level," then a few other associated competencies might be linked to it, such as "Working on Scaffolds" and "Ladder Work." Any given task will be associated with more than one hazard. And hazards that apply across the board because of the nature of the work site will be assigned to all employees. The entire crew working on a high rise building under construction, for instance, might not all need the same skill sets but they will all need to have some basic competencies associated with fall prevention. Once your database of employees, jobs, potential hazards, and required skills is complete, it will be linked with all available, relevant, compliant occupational safety training. Some of these are essential for complying with the law, while others are optional. Competency mapping is a dynamic system, constantly changing and growing as your business needs change, as laws are updated, and as employees are hired or retire. The success of competency mapping systems depends on a dedication to health and safety. And companies that strive for excellence make this a priority.